The Temptation in the Wilderness by Briton Riviere, ca. 1920. For Ash Wednesday, we join our brothers and sisters in Sri Lanka for this Sinhalese Lenten hymn. I do not have the English lyrics, but the video and music speak for themselves. 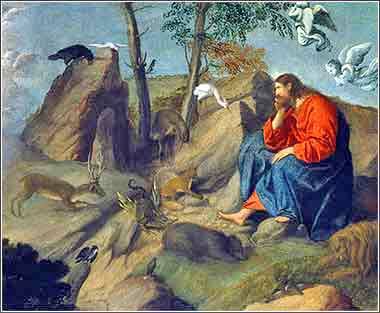 Almighty and everlasting God, who hates nothing you have made and forgives the sins of all who are penitent: Create and make in me a new and contrite heart, that I may begin this season of fasting and remembrance of your suffering, by truly lamenting my sins and acknowledging my wretchedness. I pray that the ashes we use to symbolize the beginning of Lent may truly remind me that from dust I came, and to dust I will return, and that only by your victory over your suffering is it possible for me to find eternal peace and life. I pray for the grace of Christ, that I may obtain of you, the God of all mercy, perfect remission and forgiveness of all the sins of this life; through Jesus Christ our Lord, who lives and reigns with you and the Holy Spirit, one God, for ever and ever. The troubles we have in life, if we see them as part of God's loving plan and accept them as being what he wants for us, will actually help us to grow in knowledge and love of him. Even when things are at their worst, keep your peace of heart and accept whatever God sends you as being for your good. 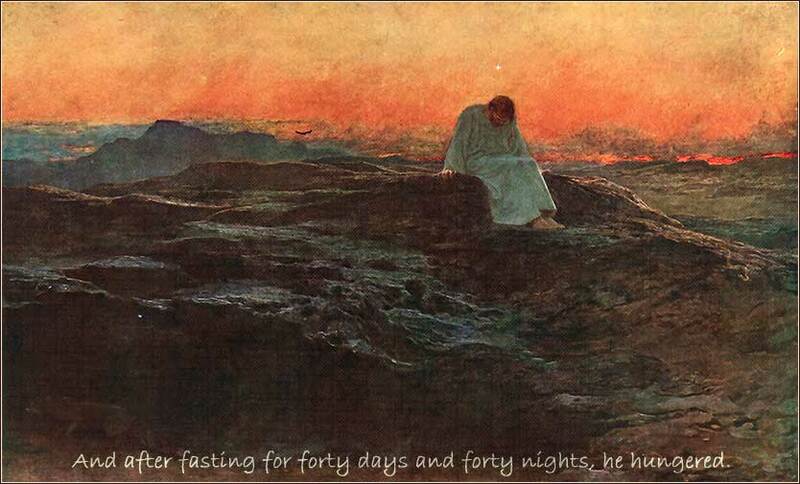 The length of Lent refers to the fast Jesus undertook before He began his ministry. This is a point of confusion or ambiguity for many people, because Christ's fast occurred at the beginning of his ministry, right after he was baptized by John the Baptist, not in the days leading up to His crucifixion. The Lent we celebrate is thus a combination of two different things. First, we observe a period of solemnity leading up to Good Friday. The three traditional practices emphasized during Lent are prayer, fasting, and almsgiving of some sort. The most common modern-day practice is to give up some vice or earthly pleasure. We prepare ourselves for the tragedy of Christ's terrible suffering by a token, but real, bit of self-denial ourselves. We endure a bit of physical discomfort, to remind us of the agony Christ will suffer on our behalf. Secondly, we emulate Christ, who fasted for 40 days before going out into the world. Just as he tempted Christ, Satan constantly tempts us. He would have us immerse ourselves in desiring the things of this world — and so, to thwart him, we take a break. We step back and remind ourselves that all of the delicious food or glittering objects of life are not the real point. Although our sacrifice during Lent may be small, it is a moment when we demonstrate, physically, that we belong to God.